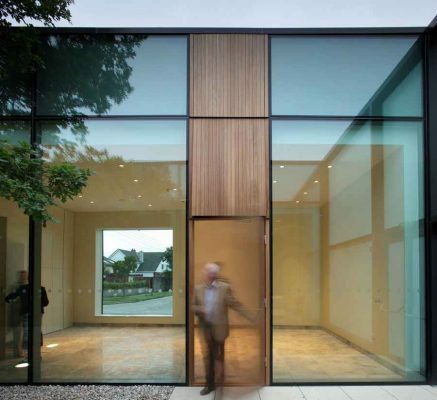 South Dublin County Council undertook to refurbish and extend the library in Ballyroan in 2006. Part of the brief involved refurbishing the community centre and provision of additional pastoral facilities; however it became evident early on that a separate building was required for this element. 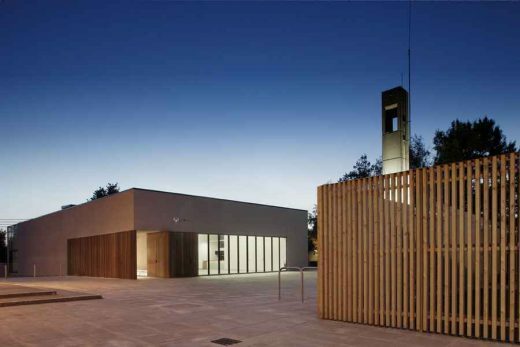 Pastoral Centre – A 25-year-old oak tree sparked off the idea to create a building arranged around internal courtyards with the oak tree located in the largest courtyard. As it is a spiritual and sometimes private building, it was important that views in and out were controlled to avoid disturbances, and very selective openings where provided to maintain this privacy. Courtyards have opaque glass or are focused internally, while openings with clear glass provide glimpses from within and from the outside – the main entrance, fully openable doors from the main hall for use in larger gatherings, the flush square window to the west to the large meeting room, and the high-level sky-view window over the kitchen. All windows are kept flush to maintain the solid feel, except for the high-level kitchen window. To signify that the building is open, a large timber pivot door leads people into a low, stone-lined entrance space, with a simple bench to sit on. The timber element continues as a set of fins to create an open yet enclosed transition entry space. The building materials are carefully limited to create a calm spiritual feeling – simple rendered walls, timber doors, stone floors, and glazed screens affording views into the inner courtyards. Rooflights are arranged to highlight the movement of light, again signifying the spiritual nature of the building. The building is very energy efficient and close to passive house standards, with elemental U values of 0.16 w/m2k, achieving an A2 BER rating.